Serving toasted subs, soups, salads, wraps, and pastas! Quiznos Subs is located at 134 S Central Ave., Los Angeles, CA, 90012; just a few blocks away from the Metro Gold Line (Little Tokyo/Arts District Station). For your best route, use the Trip Planner. 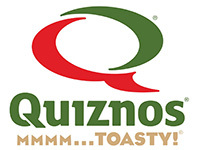 Visit www.quiznos.com or call 213.437.0088.